It’s a Beautiful Day for a Blog Tour! If you’ve been participating in the Quiltmaker’s 100 Blocks Blog Tour this week then I know you have seen some amazing blocks and you are just “itching to get stitching”! I hope you will find my design Tea for Tulips equally appealing and that you will rush right out to purchase your copy of Vol. 11, 100 Blocks magazine, it’s on sale now where all the best magazines are sold! Applique is my favorite way to design. I love coming up with a concept, sketching it out, and then creating a pattern from the sketch. Once I have the pattern complete, it’s just a matter of tracing the pieces with my favorite fusible, Heat ‘n Bond Lite, cutting them out and fusing them to the backside of the appropriate fabric. Once I have all the pieces fused, I cut them out on the drawn line and fuse the final design to the background fabric. Then I use either a blanket stitch, a satin stitch or if I’m feeling really adventurous, I may use some of the decorative stitches on my machine to appliqué the design to the background. I’ve come up with some ideas of how you can use my Tea for Tulips design on page 35. Of course you can always make a few blocks for a tablerunner just by stitching three blocks together. Two people will receive free issues of Quiltmaker’s 100 Blocks magazine, Vol 11., one mailed to you from Quiltmaker and one mailed from me. ← Everyone Loves a Little Something FREE! Flurrious Fun! What a cute pattern. So many cute patterns I had a hard time deciding but settled on Me & My Peeps. Thanks for the chance at the magazine but better yet, one of your patterns. I love the Me and My Peeps! My grandsons would like Summer Pond. I love the TeaPot. Stitching addiction is so cute, but i love all of them! I love Me and My Peeps! Ha Bum Hug is for me! So cute. Thanks for the opportunity to win. Cute patterns! I like Peeking Penguins best, but they’re all great! Thanks for the chance to win! My Favorite Earrings is my favorite, I’ve admired that one for a while now. 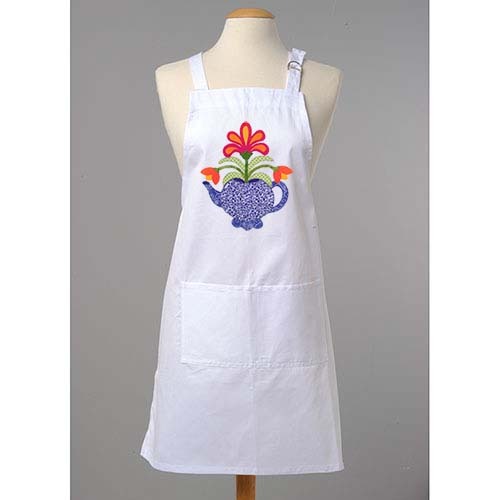 Tea for Tulips is spring personified! Love all your patterns, but Flurrious Fun. I love them all, but Stitchin’ Addiction would be my pick. Love the Monkeys in Action Jackson, but I like all of your patterns. I love so many of your patterns, it was hard to choose just 1. I think I would most like to make Me and My Peeps 1st, so I will say that one. Me & my Peeps – but what a hard decision! I liked Cruisin’. thanks for sharing and a chance to win. 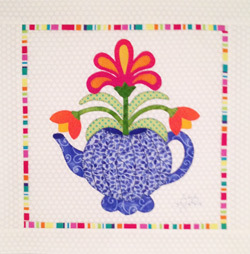 Your teapot block is one of my favorites in this new issue – so fun and happy and whimsical! It will be one of the first I make 🙂 And of course I’d love to win one of your patterns – Me and My Peeps is absolutely adorable!!!! I LOVE Tweet! I already have Me and My Peeps – it is in my piecing queue – hoping to start it soon. Hoping to see you at another quilt show this year! Love your patterns! I love your block and the runner, fun idea for the kitchen or dining table. I love your Cruisin pattern, we love biking and i have a lot of biking friends so that would be so fun to customize for them. I love the Santa Mouse! So sweet. I love several and would be happy with Santa Mouse or Stitch. I like Me and My Peeps. So cute! Me and My Peeps. Adorable! But then all of your designs are! LOVE the Gorgeous Gourds pattern-perfect for my new sewing room!! Sew many awesome patterns, hard to choose one. Gorgeous Gourds – Me and My Peeps. I love your block! Congratulations on having your block in the magazine! Hope you have a great day and thanks for your designs. ” Here comes the Sun” pattern is my choice. I love the block you created for the magazine also. It is so pretty. Thank you for a chance to win. I love the pattern “Stitch”. Thanks for the opportunity. I LOVE Jiggity-Jig! My screen name is goonybird/goonyburd, and this looks like one to me! I love Santa Mouse! Thanks for the chance to win a copy! You really do have the cutest patterns. I just fell in love with Snowmen. I love seeing all your different ideas using your block. Thank you for being a part of QM’s 100 Blocks, Volume 11 Blog Tour, sharing your block with all of us and giving us the chance to win. 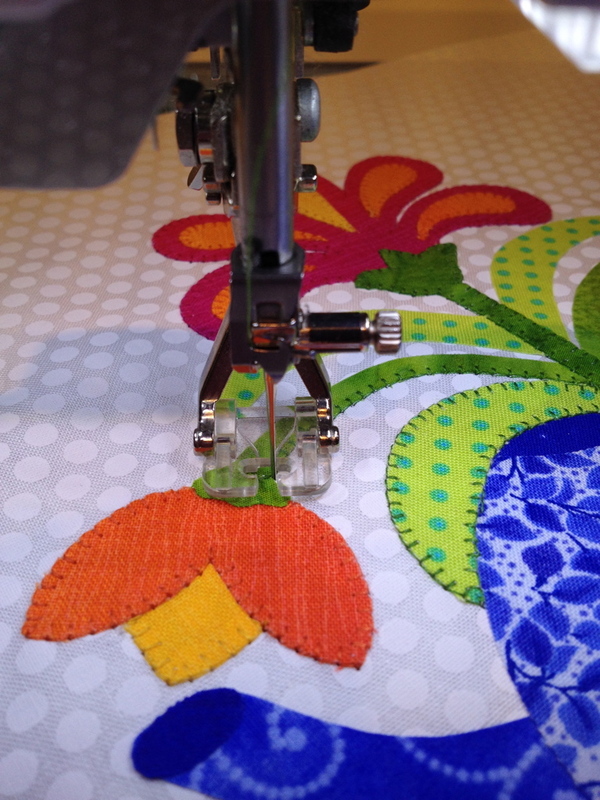 I really like Stitchin Addictions – your patterns are great! Your teapot might actually be my favorite. It is lovely! However, Stitchin’ Addiction looks rather fun. Thank you for joining in on the tour! I’d choose Ha Bum Hug – there are a lot of scrooges I know that could use the humor! I also have a dear sister in law that collects teapots and I think your block is just the ticket for a wall “cutie” to display with her collection! Awesome block! Love your Tea for Tulips block! With so many cute patterns on your site, it’s hard to pick just one. My favorites are It’s Fall Y’all and My Favorite Earrings. Thanks for the fantastic giveaway! Love your block! I would pick Cruisin’. I liked Stitch and would love a chance to win it. Thank you! Such cute patterns! I would like the “Me and My Peeps”. Thanks for sharing! Your patterns are so much fun! I think right now I would have to choose Action Jackson. My Favorite Earrings – Giraffe Quilt Pattern. That was a hard choice, all so cute! Love Gorgeous Gourds and your block is pretty sweet too! Everything is so fun looking but I guess Frog Days would be my choice, new follower and not because I want the pattern from the other day but because I like you. Love the Ha Bum Hug! That is really cute. Peeking Penguins is cute also. Great patterns. Frog Days of Summer is just delightful! Looks like my youngest, full of mischief. Your block is just wonderful. Such a versatile block. I love the colors. Thanks so much for sharing. Every pattern is prettier than the next but when I came to Cruisin’ that was the one for me!! Lots of cute patterns! Stitchin addiction is probably my favorite but I absolutely love the randomness of that beach-ready flamingo. Cute patterns! My favorite is “Tweet!” (although Snowmen – some assembly required is awfully cute too.) I really like your teapot block for the magazine! You have so many cute patterns, it was hard to pick just one so I picked Whoo,Whoo, Whoo and Sweety Cat. Your teapot block is adorable! Thanks for a chance to win. Loving the Frog Days…too cute. Ha Bum Hug! or Stitchin Addiction. Love your sense of humor. You started my day with a smile. Thank you. All are adorable, but I love ‘Stitch’. Really. Love the flowers on this block! So graceful. My favorite pattern is “Me and My Peeps”. My favorite is my favorite earrings. Sew many cute patterns. My favorite would have to be Sweety Cat. Thanks for the chance to win !! What a cute block. I love it. Congrats on being chosen to be in the magazine. I love the Sweetie Cats. I like Santa Mouse and Stitchin’ Addiction. Very fun! Ha! I love your playful sense of style – and Hissyfitz! Such a clever name. I would love the Stitchen Addiction pattern to make as a wall hanging in my sewing room! I love both Me and My Peeps and Tweets. Your Tea for Tulips is so charming. I like designs like it. 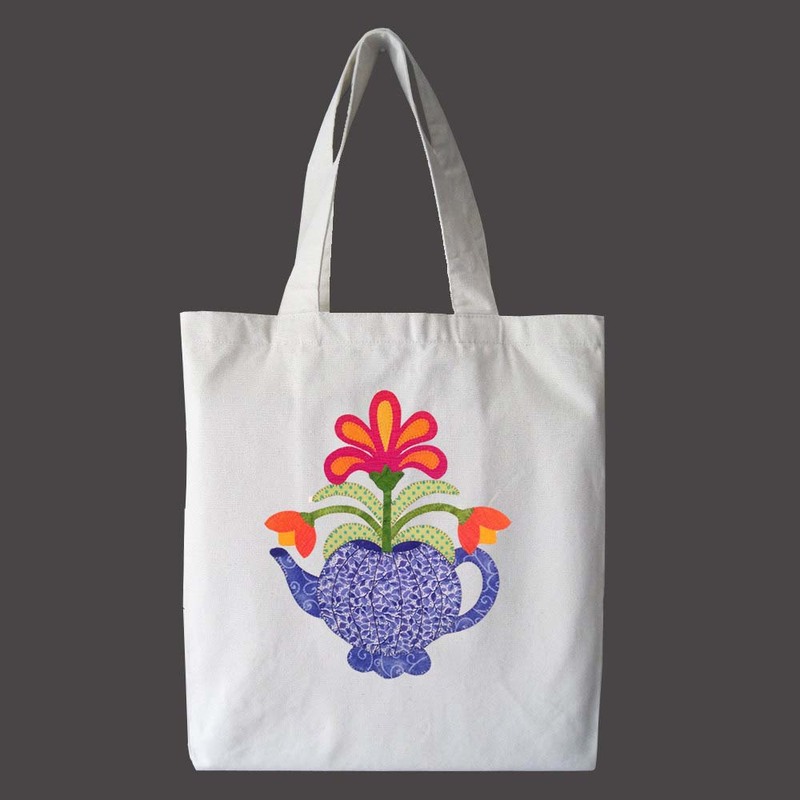 I’m a tea drinker, so I can definitely see myself carrying a tote bag that has been “prettied up” with your Tea for Tulips pattern. 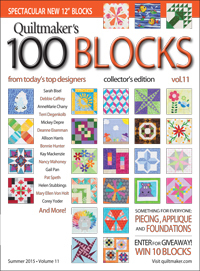 I can’t wait to get my copy of this 100 Blocks issue! I like your crusin’ pattern best. My favorite is Frog Days of summer. I’m always looking for cute little boy patterns. I love the Sweety Cat quilt. My daughter is a cat lover and would love to snuggle under those cats. I definitely want to make the teapot. Sweety Cat is my pattern choice. Sweety Cats is calling my name. Love it and also your teapot block. I love your cheerful teapot block design. I would like the Candy Cane Trio pattern. I’d love to win Whoo Whoo Whoo. Thanks for sharing your cute block. Cruisin’ is my favorite, but there are a few that could be a close second! I love your Giraffe quilt. They are so cute! i have a soft spot for teapots, so A Spot of Tea was going to be my choice, but Stitch just caught my eye and wouldn’t let go! Candy Cane Trio is cool and looks like even I, a non-appliquer could do it. I love your Tweet pattern. Me and my Peeps, I almost bought this in padauch, but your booth was so….busy, congrats on your block in the book, beautiful. Your giraffe pattern is wonderful, it’s near the top of my todo pile. I like Owl be seeing you and also A spot of tea. Cute Patterns! I like the Peekin Penguins. I like Tweet! I love your apron an tote bag. I like the Sweety Cat. I like Cruisin. Beautiful block. Thank you for the giveaway. There are so many I like but if I had to choose one it would be ‘Frog Days of Summer’ and the little boy would have brown eyes in the one I make. I think my grandson would get a kick out of this cutie. I love your teapot, congratulations! It was a hard decision but I really do like Tweet, I can see so many uses for it besides just a wall hanging. Great block and super ideas for using it in different ways. I love Ha Bum Hug! I know just the person I would make it for. Thanks for the nice giveaway! Ha Hum Bug is just so me! Tea for Tulips is adorable! Me & My Peeps definitely. thks. I’d pick My Favourite Earrings. Sweety Cats and Santa Mouse are just too cute. Your patterns are adorable. I love your block as I love all things tea related. My pattern of choice would be My Cup of Tea. I really like Sweety Cat..it is so cute. I like Its Fall Y’all. The Snowmen – Some Assembly Required is adorable! I love the giraffes, they melt my heart! Frog days of summer is TOO CUTE! I love “Snowmen, Some Assembly Required”. gorgeous gourds is my favorite, beautiful colors! My Favorite Earrings–I’m a nut for giraffes! I adore the Santa Mouse! Love your work! You have such cute patterns!! I am going to be a first time Grandma in the fall and would love to make “Action Jackson”. Thank you for the nice designs! Who can resist a giraffe!! My pattern choice has to be My Favorite Earrings. I collect teapots so will have to add your block to my to do list. So cute!! I would like win “Ho Hum Hug” Can’t wait to see what new things you’ll be coming out with. Bah Bum hug! What a fun wall hanging for Christmas. So many cute patterns. Love the Stitch Addiction, but Stitch is sweet too. You have a wicked sense of humor! Forced to choose, I would pick Peeking Penguins. But the birdhouse in Me and My Peeps looks just like the one my parents made me as a wren house. Hmmmm…. Stitchin’s Addiction. Thanks for the chance to win. I love your cute patterns. My choice would be the “Candy Cane Trio”, I think it would make a cute tablerunner. I love all of your patterns but Stitchin’ Addiction I think is the best so that would be my choice. Can’t wait to see your newer pattern too. My favorite is Frog Days of Summer. So cute! Thanks for sharing! I LOVE giraffes so “My Favorite Earrings” would be my choice. Awesome! Me &My Peeps is my favorite. Darling pattern. I have a weakness for birdhouses. Stitchin’ Addiction is one of the most fun patterns I’ve seen in a while! 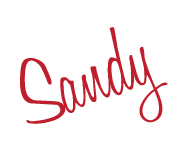 Sandy – I’d love Stitchn’ Addiction! But I have to confess, it is really difficult to choose just one from your pattern selection! Love Bah Bum Hug! Loved meeting you at Lancaster and would love to add this to my collection of your patterns. So so hard to choose just one! I love all of your patterns, but Stitchin Addiction is my favorite! Cute pattern. The striped fabric is a nice touch to your block as well. I love Me and My Peeps and Cruisin!!! So cute and fun!! Love em all! But “Snowmen-Some Assembly Required” is adorabley fun!!! & I sooo love “Spot of Tea”!! I ADORE Stitchin’ Addiction! Thanks for the chance to win! Stitching Addition would be my choice. Bought your bike pattern in Paducah enjoyed meeting you there. Love your block. Enjoyed checking out your patterns and really like Tweet!. Cute block. Love the Tweet pattern!! Thanks. Hi, not sure if this has finished but I will give it a go regardless, Very difficult to choose a pattern from your page, but I think TWEET, would be cool to win, many thanks for the fun competition and I wish all good luck. I am in UK so not sure if I qualify to enter……Also signed up for your newsletters and got the pattern which is great many thanks. You are so creative and have many unique patterns. I was drawn to My Favorite Earrings…a giraffe quilt pattern. My grand-niece is wild over giraffes and I’d make this for her. Stitch! So appropriate for gals like us. It was so nice to meet you at the shows in NJ and Lancaster in March. Choices, choices. I think Santa Mouse. They are all so cute.